For some moviegoers, it’s almost magical whenever a character in a film actually says the title aloud as part of the dialogue. In his review of Godard’s Hail Mary, for instance, John Waters singles out such moments for high praise, citing Boom! and What’s The Matter With Helen? (the “cinematic question of the century”) as particularly fine examples of the phenomenon. And when a character in Hail Mary actually says the titular phrase aloud, Waters reports, “I thought I would levitate out of my seat.” Magician Penn Jillette, who once belonged to a Times Square movie-watching club, has been known to applaud at such moments. And now, there is an entire supercut devoted to movie characters saying the titles of their respective films out loud, but this one has a bit of a twist to it. Created by YouTuber Chris Huebs, “If Movies Ended When Someone Said The Title” imagines a parallel world in which invoking a film’s name audibly is akin to casting a spell that immediately conjures up a film’s closing credits. Say the title and the movie is over. Simple as that. Also, in this parallel world, every film ends with a very hacky, overused pop or rock song that effectively shatters the mood. Take Jurassic Park as a test case. 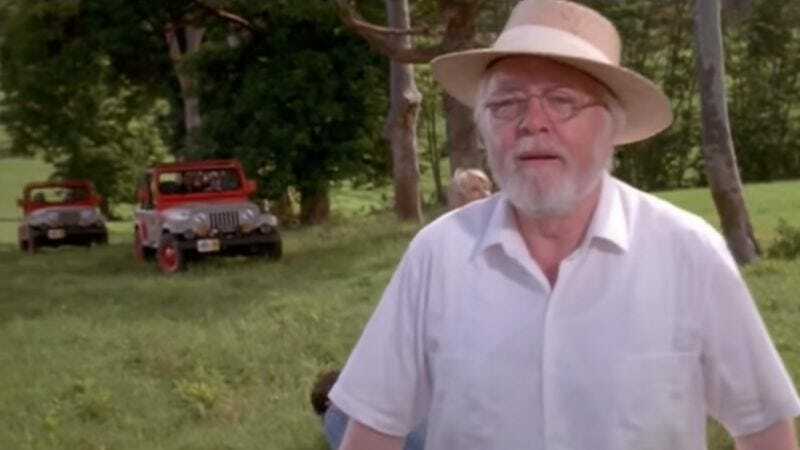 No sooner has Richard Attenborough introduced Sam Neill and Laura Dern to his reconstituted dinosaurs than he grandly announces the name of his proposed attraction, bringing the narrative to a sudden halt. Cue “Break Stuff” by Limp Bizkit. Here, then, the movie is a success story about a man who opens a theme park with real live dinosaurs, and everything turns out great. John Woo’s Face/Off basically peaks when Nicolas Cage dreamily intones, “I’d like to take his, his face… off!” So why not just end it right there, using “Summer Nights” from Grease as a nod to costar John Travolta’s cinematic past? Really, if Hollywood took some cues from this supercut, movies would be a great deal shorter, less expensive, and possibly even more satisfying.